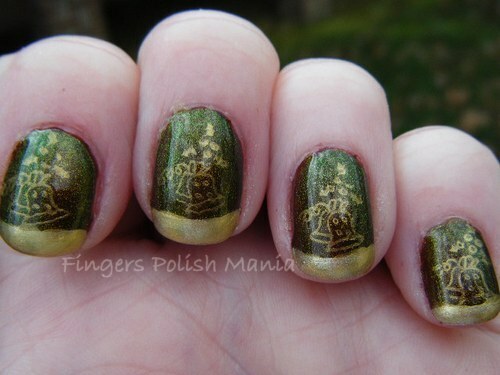 fingers polish mania: How Freakin Cool Is This?! 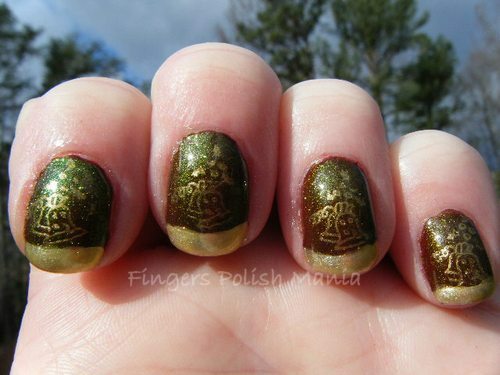 Once in a while, a mani comes along that really is something great. I am all sorts of excited about this one. I will be tooting my own horn all through this post. Get ready for it! 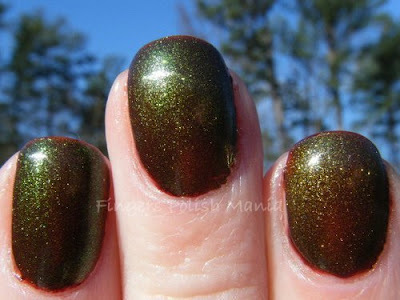 Lately, my manis have either been too subtle, or just not all that great. So I really surprised myself after I created this one. It is going to be legendary-in my own mind of course! Are you ready for greatness?? Maybe I should rethink this whole build up-because what if you guys don't agree with the greatness? Then I guess you'll all be wrong! First up, the really silly bottle shot. 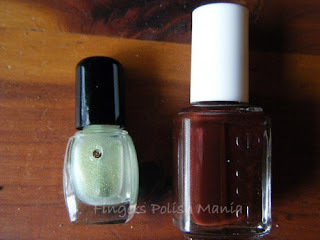 A few months back I did a swap with Carly at Lacquered Lover. She got Essie Mint Apple from me, and I got this beauty, Lady Godiva. Before we start the layering, I want to show you a quick layer of just Lady Godiva on its own. It is a stunning mahogany reddish brown. This is one coat with no clean up. A lot of times, darker colors look black on the computer screen. 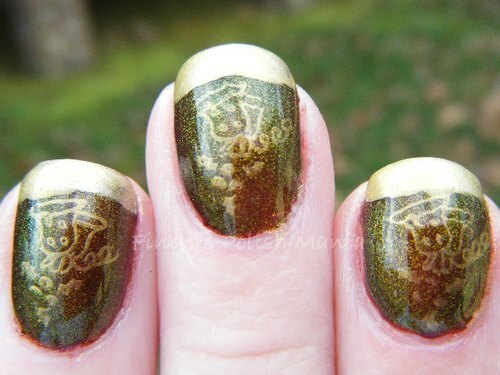 I chose to show you this one layer so you can get an idea of its beauty. I just love it! Thank you Carly! The other bottle in the above picture is from Pam at Girly Bits. She is a Canadian blogger who has started making and selling her own polish. Today I give you her Street Magic. 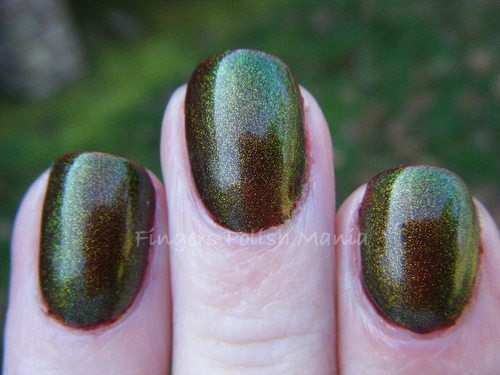 This is a duochrome shimmer goodness that glows red, green, brown and gold. Get ready for a bazillion pictures. I did two layers of Lady Godiva and one layer of Street Magic. Here are your shots. Can you see all the different colors in this? It's even more awesome in person! I am so loving this-I ordered a VAT of it! 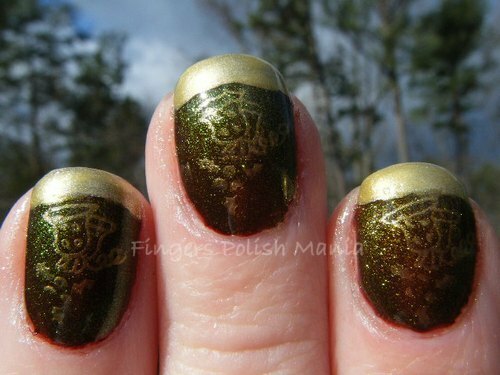 Since I was doing Christmas manis, I grabbed my Konad special polish in Gold and my XXL plate 4. 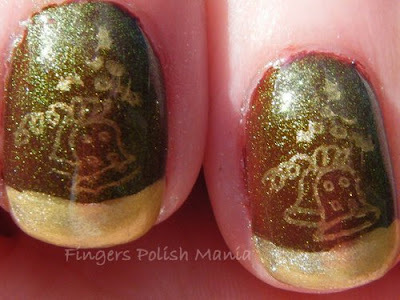 I stamped bells in gold and topped it off with my funky french. Get ready for the greatness. I got to tell you that I think this is one of the best designs I've made so far! I am absolutely in love with this. I got a lot of compliments on it. The colors that glow from the Street Magic in different light is just amazing. So we come to the time where you guys decide-is this true greatness as I have said? Or are you thinking something else? Am I just a legend in my own mind?